JYM Supplement Science Mass JYM at Bodybuilding.com - Best Prices on Mass JYM! Mass JYM™ is a revolutionary mass-gain formula that has taken years to perfect. It’s the first of its kind, a true non-proprietary mass-gainer that fully discloses the specific types of protein, carbohydrates, and fat contained so that you know exactly how much of each macronutrient you’re consuming. It’s not enough to know just the total amount of protein, carbs and fat that a mass-gainer provides – you need to know the precise amounts of each type of protein, each type of carb, and each type of fat. Otherwise, you won’t know if it’s a lean-mass-builder or just another “fat-gainer” made of cheap protein concentrate and sugar. I essentially designed Mass JYM to be Pro JYM™ plus an equal amount of carbs – primarily low-glycemic and the perfect (and patent-pending) fat blend. Designed to the exact specifications as my award winning Pro JYM protein – each serving of Mass JYM delivers 30 grams of the highest-quality protein powder blend available. 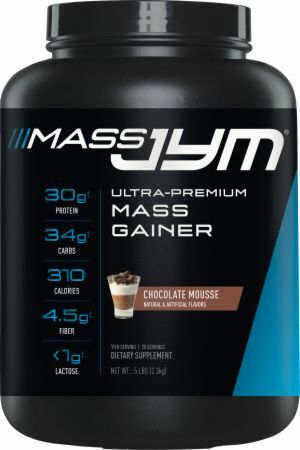 Mass JYM delivers 50% casein from micellar casein and milk protein isolate; 40% whey protein from cold-filtered whey protein isolate and milk protein isolate; and 10% egg white protein. Mass JYM’s ratio of low-glycemic (low-GI) to high-glycemic (high-GI) carbs is another key aspect that makes this formula a true lean-mass-gainer. 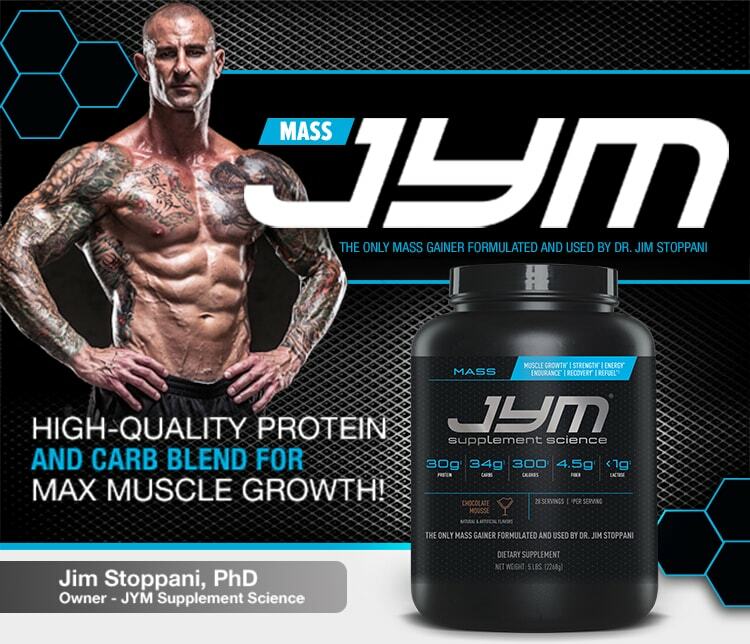 I designed the carb blend in Mass JYM mainly from pea starch, isomaltulose, and oat fiber to deliver a 3:1 ratio of low-GI to high-GI carbs. At this ratio, you won’t spike insulin (outside of a normal range) or add fat as easily as you would with a mass-gainer that uses primarily high-GI carbs like sugar, dextrose, or maltodextrin [3, 4]. It also means Mass JYM works well as a pre-workout carb source, as it provides a small amount of quick fuel followed by a larger amount of long-lasting fuel [5, 6] to help provide energy from the start of your workout all the way to the end. Research further shows that when consuming carbs before and/or during workouts, the body’s testosterone-to-cortisol ratio is higher, suggesting the body is in a more anabolic state. Another way carbs are essential to maximizing muscle growth has to do with muscle cell volume. Glycogen, the storage form of carbohydrates in muscle, pulls water into muscle cells. The higher the muscle glycogen content, the fuller (bigger) the muscle will be. Yet maximal muscle cell volume has more to do than just looking bigger – it also places a stretch on the muscle cell membrane that can help signal biochemical pathways leading to an increase in muscle protein synthesis, which can lead to long-term increases in muscle growth. Fat is the most misunderstood macronutrient. It was deemed the devil for decades before real science stepped in and showed how essential most fats are. After protein, I consider fat the second most critical macronutrient, especially if gaining muscle mass and strength is important to you.